What's not always visible is a vortex coming off of the tip of each wing—like two tiny horizontal tornadoes—leaving behind a turbulent wake behind the vehicle. The wake poses a destabilizing flight hazard, particularly for smaller aircraft that share the same flight path. Recent research at the University of Illinois demonstrated that, although most wing shapes used today create these turbulent wake vortices, wing geometrics can be designed to reduce or eliminate wingtip vortices almost entirely. In the study, the vortex and wake characteristics were computed for three classic wing designs: the elliptic wing, and wing designs developed in classic studies by R.T. Jones and Ludwig Prandt. "The elliptic wing configuration has been used as the gold standard of aerodynamic efficiency for the better part of a century. We teach our students that it has the optimal loading characteristics and that it's often used when looking at wing efficiency for say, minimizing drag," said Phillip Ansell, assistant professor in the Department of Aerospace Engineering at U of I. In a previous experimental study on optimizing wing configurations, Ansell learned you can gain efficiency of the wing system with a non-elliptic wing profile. "Previous academic studies have shown that, theoretically, there are other designs that actually provide lower drag of a planar wing for a fixed amount of lift generation. But what has been missing is an actual apples-to-apples experiment to prove it." In this new research, Ansell, and his graduate student, Prateek Ranjan, used the real data from the previous study to analyze the three wing configurations. "We chased this down because we saw something curious in our measurements in the earlier experiment. Consequently, in this new study, we simulated the flow about these three wings and saw significant differences in how the vortices and wakes developed from each of the three wing types. The Jones and the Prandtl wing configurations didn't have wing-tip vortices like the elliptic wing. They had a much more gradual bulk deformation of the whole wake structure, rather than an immediate coherent roll-up. We now know that we can delay the formation of wake vortex structures, and increase the distance it takes a trailing wake vortex to roll up by about 12 times, making it weaker and less of a hazard to the aircraft entering its wake." Ansell said this information can be used to re-tailor how formation flight is viewed between aircraft, or to develop a new an ideal configuration for the lift loading for takeoffs and landings, and subsequently reduce the length of separation between aircraft in the same flight path. "Trailing wingtip vortices tend to take a long time to go away once they form in the atmosphere. So the time it takes for the vortex to dissipate has to be figured into the takeoff time of the next aircraft going in that same path. The motion of the air produced by these vortices can create a hazard for trailing aircraft, as it can be unpredictable and make for dangerous flight regimes. So using the Jones or Prandtl wings would result in much less turbulent air behind a plane," Ansell said. You'd think that Ansell's conclusion is to use only the Jones or Prandtl wing configurations, but it's not. "One of the things that first drew me to the topic of aerodynamics is that the right answer always depends on what your constraints are. If you're building a tiny unmanned vehicle that will fly at a low speed, you'll get a different solution for design needs than if you're building an aircraft that will carry people at high altitudes and high speeds. So technically, you could argue that all three wing types are the best solution. The question is, what are your driving constraints, such as wing span and weight, behind selecting one of them?" Ansell added that this is a basic research study and not intended to advise a specific aircraft designer or company. "We are looking at how the wing flow behaves and the information can be used to understand how the roll-up process of vortices is produced. This study allows us to be aware of how the wing configuration affects the trailing vortex formation and wake by studying the extreme bounds of immediate and delayed vortex roll-up processes," Ansell said. "Interestingly we identified that one of the worst offenders of creating vortices is indeed the elliptic lift distribution, which is also among the most conventional wing design. It has definitely changed the way I talk about the issue in my classes. Instead of simply referring to the flow patterns produced behind the wing as a pair of 'wingtip vortices,' I've taken to describe the full wake produced as the trailing vortex system." The paper, "Computational Analysis of Vortex Wakes Without Near-Field Rollup Characteristics," was co-authored by Prateek Ranjan and Phillip J. Ansell. It appears in the Journal of Aircraft. I would think that saving the energy to create the cortexes in the first place would also reduce overall drag. I didn't see this mentioned. Either that or the amount of energy saved is miniscule. Anyone know the right answer? The picture above is a fake. (1) First of all the the trailing clouds from the plane look like they have been added by a PC mouse, and made up of many circles. Definitely a computer generated image. (2) The plane is in a position to land, not take off. The flaps are down. 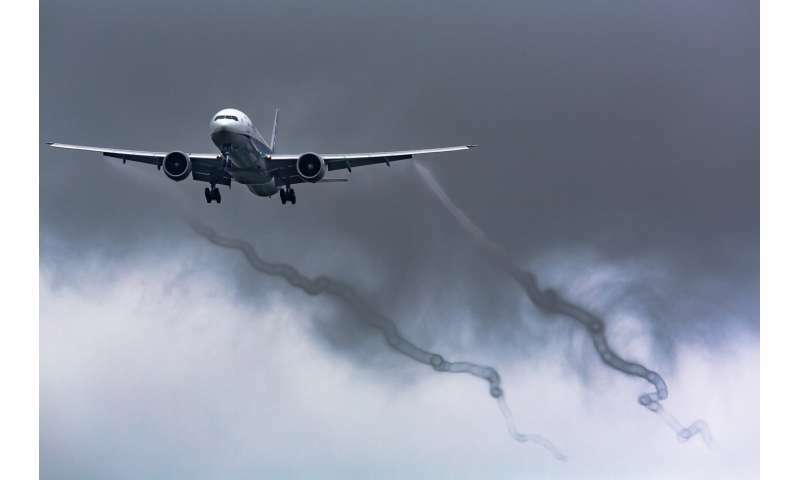 The dangerous vortices are produced by planes taking off, not landing. (3) The supposed trailing clouds are coming from the flaps, not from the wing tips. The dangerous vortices come from the wing tips. No, the picture is not a fake. This article does not mention that only during take-off and landing do the dangerous vortices form and they are due to the high lift coefficients that wings with flaps and slats need to develop in order to fly slowly. Associated with these high lift coefficients are high drags and these are the necessary result of this part of the flight profile. At high speed at cruising condition there is no problem with the vortices and indeed it is here that the aerodynamics are designed to provide the most efficient passage. So this research into better vortex control only applies to the low-speeds where the lift distribution across the span is anything but ideal and certainly far from being elliptical. The criterion for it should be that a flapped and slatted wing can still operate at a high lift coefficient or the research exercise is pointless. There is an alternative and that is to reduce the wing loading with greater sized wings and indeed all-wing aircraft can solve this problem.